My last two City Talk columns (here and here) dealt with a lot of details regarding the Unified Zoning Ordinance, a decade-long effort to streamline and clarify zoning in Savannah and unincorporated Chatham County. We need to pass this thing. The problems with the current zoning system are pretty clear. Right now we have conflicting language for the city of Savannah versus the unincorporated county. We have 126 zoning districts, far more than much larger cities. Some current development requirements do not work for urban settings, which results in an inordinate number of appeals for variances. And too many property and business owners simply can’t find their way easily through the complex documentation and bureaucracy. 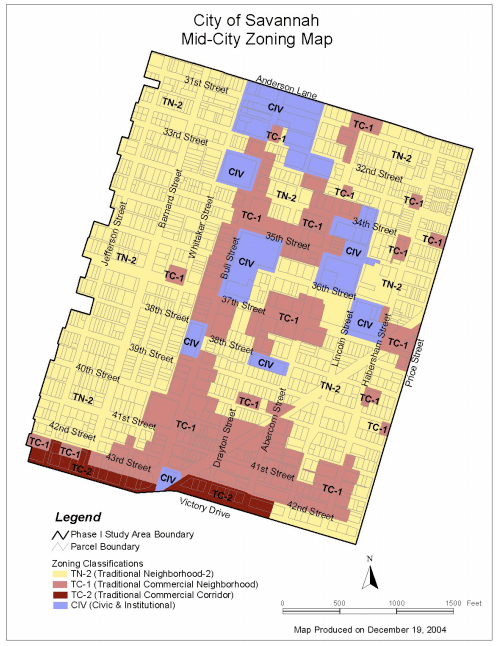 The cumbersomeness of the current zoning ordinances has certainly hurt economic development. No doubt about that. The Unified Zoning Ordinance, which will eventually need to be approved by the Savannah City Council and the Chatham County Commission, addresses all of these issues. Those 126 districts will be whittled to 39, for example. Back when we had 40 or so fewer zoning districts, a consultant noted that there was “no rational reason” to have so many. The Thomas Square areas used to be one of the worst patchworks of districts — pretty much none of which addressed actual conditions on the ground — but the neighborhood zoning was updated after a long process that ended in 2005. Below I’m pasting the updated map, which has as you can see just four districts: a mostly residential district that allows for some mixed uses, two commercial districts allowing for varying degrees of intensity plus residential uses too, and a district for institutions — government buildings, nonprofits, churches, schools, and so forth. By the way, in zoning lingo, a “district” is a particular classification that can be applied to any particular piece of ground. The new zoning in Thomas Square brought more clarity and flexibility while also respecting existing development patterns and dramatically reducing the need for variances. I’m happy to field questions as I can about this, but I’d suggest that interested parties engage directly with planner Charlotte Moore and her colleagues at the MPC. ← Housing bust + Changing lifestyles = Boon for cities?